What Are the Specific Nutritional Needs of a Boxer? What Ingredients Should be Avoided When Choosing the Best Food for Boxers? How Much Should a Boxer Eat a Day? 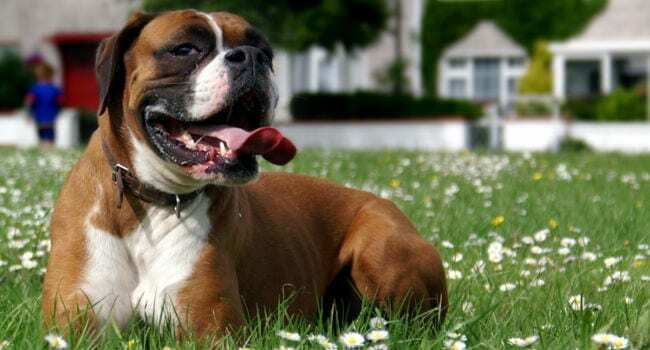 What Are the Common Health Issues Associated with the Boxer Breed? What Types of Ingredients Are Boxers Commonly Allergic To? 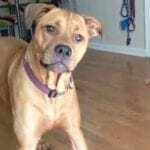 What Are the Signs That a Boxer Is Experiencing Allergic Issues? What is the Best Dog Food for Boxer Puppies? You gaze lovingly into her deep brown eyes, admiring the sleekness of her form, and tell yourself how lucky you are to have her in your life; then suddenly, WHAM! You are struck by what feels like a bus as she pounces on you and delivers a large pink tongue to your face, then tears off in a fit of jumping from couch to chair and racing from room to room in a frenzy. This is the life of the owner of a Boxer. This German bred dog is a high energy, loyal, animated and overall happy canine with a shyness to strangers and a fierce loyalty to family and friends. Keeping your Boxer happy and healthy starts on the inside by feeding them the best dog food for Boxers and their high energy dietary demands. Use the following information and comparisons to help you decide which type of dog food is the right one for “the love” of your life. The Boxer is a bright, playful, and active medium breed dog that can weight between 65 to 80 pounds for a male while the females typically weight 50 to 65 pounds. It's important that you feed them a diet that supports their healthy growth and maintenance throughout their lives. But, how much should a Boxer eat a day? We're going to give you this answer by breaking down your Boxer's age in stages. 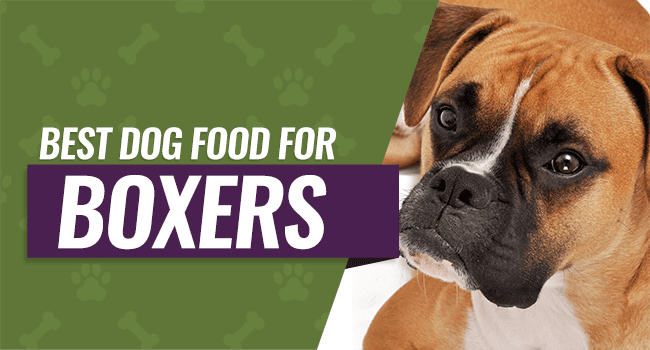 This way, you'll know exactly how much food to feed them as well as what to look for to ensure that all of your Boxer's nutritional needs get met by their food. This is the stage where you puppy graduates from drinking their mother's milk to solid food. You want to feed them three or four times a day, and they should eat at least two cups of food each day. Don't allow your puppy to free eat all day because they're prone to overeating. Your puppy's food should contain roughly 35 to 45-percent protein and 25 to 35-percent carbohydrates that are free of grains. This will help support great energy levels, strong muscles, and consistent development. Your puppy should be eating around twice the amount of food each day that you'd feed to an adult Boxer at 10 weeks old because this is the active growing stage. The additional calories are essential to help them grow and to support their higher energy levels. It's a good idea to still feed them three or four times a day with a high protein and high carbohydrate formulated food. You'll keep feeding your puppy on this schedule until they reach six months old because this is where you start to transition them to adult portions. Once your puppy is six months old, you want to try and feed them twice a day instead of the three or four times you've previously fed them. They should still eat two cups of food a day, but you'll feed them one cup in the morning and one cup in the evening. At the one year mark, your puppy is considered a young adult. This is where you will change their diet to focus on maintaining a healthy weight rather than focusing on weight gain and growth. Smaller Boxers that weight between 50 and 75 pounds should eat four or five cups of dry food split into two meals every day. Larger adults that weight between 75 and 100 pounds should eat five or six cups of dry kibble every day split between two meals. Also, feed your dog on a schedule to help keep their digestive systems regular. It's also important to make sure that you feed them two hours before bed because you want them to digest their meals. Finally, allow your Boxer to rest after meals to prevent digestive issues. Bloat – This condition is caused by ingesting foods (oats, rice, and wheat) that cause the dog excess gas and may contribute to the stomach twisting and trapping gasses. Hip and Elbow Dysplasia – This condition is a degenerative condition of the hip joints that can be more severe in Boxers that are overweight. If interested, here's an article we did on hip dysplasia treatments for dogs. Food Allergies – Many boxers are afflicted with allergies and require a specialized diet to combat this condition; it may be necessary to try different types of specialized foods to find the one that best fits your Boxer’s unique allergy concerns. Hyperthyroidism – This is the result of increased hormone levels and can be treated with medication. Cardimyopathy – This condition occurs when the main pumping chamber of the heart is diseased; it often causes fainting, heart failure, and possibly death. Aortic and Subaortic Stenosis – This heart condition is caused by an obstruction in the heart. Cancer – This disease is the number one killer of Boxers with brain and mast cell tumors occurring more frequently. It is unfortunate that the most important thing that Boxer’s need in their diet (protein) is also the ingredient that may be causing them the discomfort and pain associated with their sensitivity to allergens. 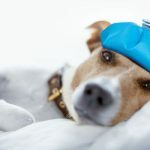 Some dogs are allergic to the proteins in some meats, while others are allergic to the proteins found in grains; this condition can be managed by trying different types of foods that contain alternate protein sources. Dogs who suffer from food allergies often portray signs of irritability by licking their legs and paws; often causing loss of hair in the area, redness, and broken skin. They also often suffer from allergic conditions that cause their skin to dry and flake as well as create redness and itching. Your boxer puppy is full of energy, growing quickly, and always ready to play. 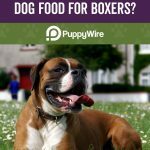 Ensuring that you feed your dog the best dog food for boxer puppies will help your puppy have everything they need to grow at a consistent and healthy rate. You want to keep several important factors in mind when you're shopping for puppy food including things like protein content, fat, vegetables, and starch. You want to get these from healthy and natural sources without having fillers or artificial ingredients. Protein will help your puppy to build strong but lean muscles, and this means that it's considered an essential ingredient until your puppy hits 18 months old. Your puppy should get 22 to 26-percent protein in their food from the time they start eating solid foods up to 18 months. You can go above 26-percent after 18 months, but this can lead to weight gain. You want to look for whole sources of protein to be in the first 10 ingredients on the label including sources like lamb, chicken, duck, beef, venison, bison, salmon, or whitefish. You're looking for protein from organs and necks because this has a higher nutritional content. Vegetables like peas, carrots, pumpkin, and other vegetables can act as healthy alternatives to traditional filler agents that some commercial dog foods use to bulk up their formulas. You should see these ingredients clearly listed on the bag instead of by-products, and keep an eye out for starches like potatoes as well. Fats and fatty acids are other important components of your puppy's diet because they promote joint health, consistent growth, healthy skin, shiny coat, and immune health. Omega-3 and Omega-6 fatty acids are the two main ones that you want to look for, and they come from fish as well as certain oils. 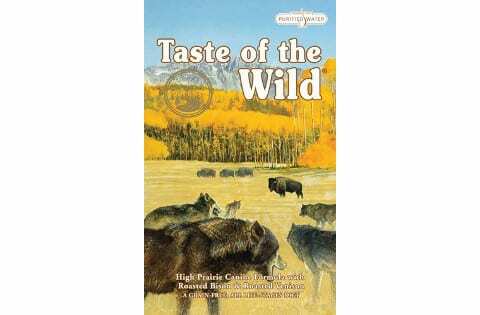 Our pick for the best boxer puppy food is from Taste of the Wild because it comes with a high-quality protein listed as the first ingredient. This food also has a smaller kibble that is easier for your puppy to eat and digest because it contains probiotics. Your puppy will get a healthy mix of vitamins, minerals, and other nutrients like DHA and antioxidants that help to ensure that your puppy has healthy brain growth along with healthy joints and bones. The chicory root feeds the probiotics while also encouraging healthy digestion as a natural source of fiber. This food is made in the USA with premium ingredients sourced from all over that are held to very strict quality control standards to ensure that your puppy gets a healthy and balanced diet. There are no artificial colors, flavors, preservatives, wheat, grain, corn, filler, or soy products. Boxer puppy parents who bought this food were happy that it came with a balanced and complete formula that helped to promote healthy brain function and growth. Boxer puppy parents did note that this food's price continues to slowly increase. 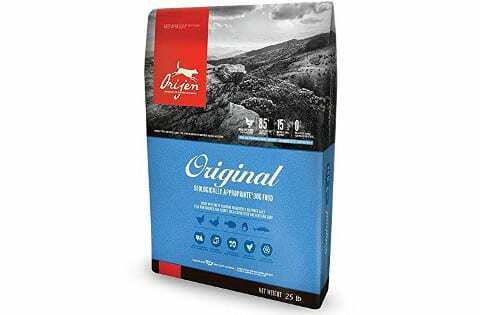 Boxers will love the big taste of Bison and Roasted Venison in this variety of dog food. 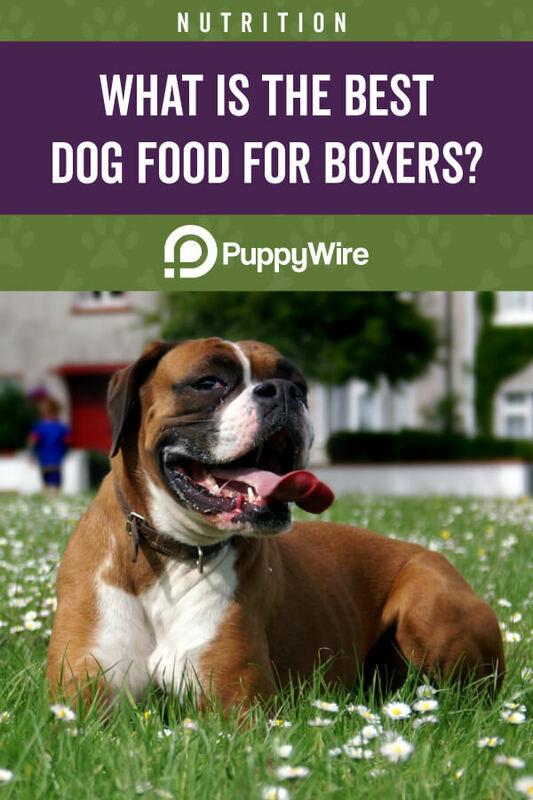 Grain-free and full of beneficial ingredients, this food is sure to be a hit with your Boxer. This combination of Bison and Venison give this blend of high protein dog food a unique taste that Boxers love. This rich and nutritious taste comes from high quality ingredients. This food comes in assorted sized bags and different flavors. The servings for this type of food are dependent on the size or weight of the dog. Feeding guidelines are located on the side of the packaging. This variety contains high energy lean proteins such as Bison and Venison. It is processed into a kibble form of dry food. This grain-free dog food is perfect for those Boxers who require a rich diet of proteins without a lot of grains to slow them down. This proprietary blend of ingredients is easily digestible with beneficial antioxidants, vegetables, and fruits. This food is safe for dogs of all ages to enjoy. The serving size is directly related to the weight of the dog and is clearly displayed on the side of the packaging. After trying this particular food, reviewers had mixed feelings. Some owners love the different types and flavors offered with this brand. Others report that their dog can not tolerate the food and developed issues with illness and vomiting. It’s also good to note that this food took a top 5 spot for the best Pitbull dog food as well. This choice for a great Boxer dog food has a number of different flavors from which to choose. The formula is supplemented with added anti-oxidants and highly digestible proteins. This food is grain free and made with real meat. Introducing this new food to your dog may cause digestive problems such as vomiting or diarrhea. There is an inconsistency with the product that causes random illnesses and stomach problems for the dogs. This whole meat dog food is formulated to accentuate your dog’s carnivoristic diet with natural and sustainable ingredients that promote health and vitality in your Boxer. This brand of special diet dog food has many beneficial ingredients such as whole green peas, carrots, spinach, etc. The only grain in this mixture is Alfalfa. There are NO artificially added vitamins and the only mineral added is Zinc Proteinate. This bagged variety of dog food comes in a 4.5 pound, a 13 pound, and 25 pound bag options. The number of servings is determined by the weight of the dog being fed. This dry food is formulated to fill the specific dietary needs of Boxers such as reducing the stress on joints and bones, low in calories to maintain healthy weight, and rich in protein to support a Boxer’s high energy levels. This food is formulated for the dietary needs of dogs at all stages of life. The serving size is directly related to the weight of the dog and if any other wet foods are included in the dog’s diet; follow the chart that is printed on the food bag. After trying this particular food, one reviewer stated that her dogs love this food so much that they drool in anticipation of being fed. Yet another owner says that their Boxer will not touch another dog food after trying this brand. This formula of ingredients are specific to the protein, allergies, and health issues that are unique to the Boxer breed of dogs. Flavor is added to this food with natural ingredients such as freeze-dried liver. All ingredients are sustainable and arrive fresh daily at the processing plant. Some of the varieties of this brand of dog food have been substituted with new formulas, which may cause a disruption in the diet of some Boxers. This type of food is not recommended for puppies. The producers of this food have decreased the size of the bag of food, while increasing the price. This dry food is specially formulated for the dietary and protein needs of adult Boxers. This highly unique blend is enhanced with ingredients that support healthy cardiac function and maintaining muscle mass. This formulation also contains antioxidants and L-carnitine for superior health benefits. These individual dry kibbles are of a loose “S” shape, which offers some tooth cleaning aspects as your dog dines on this variety of food. This variety of food has ingredients that are specially targeted to protect Boxers against the common heart conditions often found with this breed. 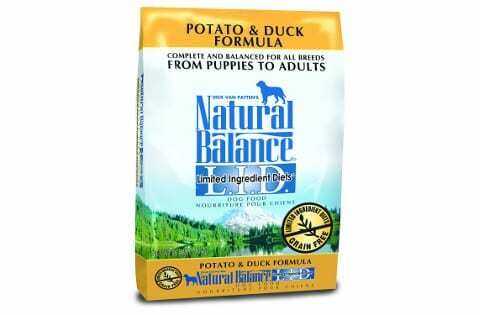 This blend of dog food is recommended for Boxers that are over the age of 15 months. The serving size is determined by the dog’s weight and age; follow the chart on the bag. After trying this particular food, many dog owners are praising the positive effects of this food on their Boxers. In one instance, the customer loves that this food is filling and he doesn’t have to feed his Boxer as much food. Another satisfied consumer states that they would stick to this brand of food even if the competitor brands were free. It has targeted heart healthy ingredients. The size and shape of the food promotes clean teeth. The unique shape of this food is specially formed to make it easier for the Boxer to pick up. Minimal allergic effects reported from dog owners who feed this blend to their Boxers. There are a lot of “extra” ingredients listed on this bag of dog food. This type of specialized food is more expensive than other brands or types of food. This brand of Boxer friendly food contains animal based proteins to promote healthy joints, to boost the immune system, and maintain a healthy heart. The first and only meat ingredient on this list is chicken. The fillers found in this mixture are corn meal, ground whole grain sorghum, ground whole grain barley, brewers flax meal, brewers dried yeast and corn meal. The only representative of vegetables in this formula is dried beet pulp. There are NO fruits or berries found in this formula of dog food. This variety comes in a 30 pound bag and the number of servings available will vary with the size of the dog. This dry food is recommended for dogs over a year old; the serving size is dependent on the dog’s weight and can be found on the side of the bag. One dog owner claims that this food has helped to keep his Boxer free of stomach issues for 2 1/2 years. Another person expressed their love of this food because of the positive effects that it has on their Boxer’s gastrointestinal issues. This variety helps to maintain weight. This particular blend of food can be fed to Doberman’s as well. Chicken is the first ingredient and is least likely to cause allergic reactions. There are a lot of “extra” ingredients in this formula of dog food. Younger dogs are not recommended to consume this food; owners must purchase separate food for puppies and youths. This healthy formula of dog food contains a mixture of natural ingredients that help to support a Boxer’s digestive system as well as their high energy levels. This formula comes in bags of 4.5, 12, 13, and 26 pound variations. The number and amount of food per serving for each age and weight of dog are listed on the packaging. This blend of grain-free ingredients is formulated to aid in digestion while giving your Boxer a shiny coat and healthy skin. There are no grains, fruits, or berries in this food to trigger common allergies. 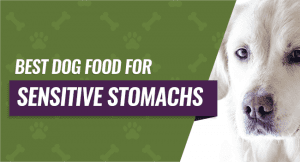 After trying this particular food on their Boxer, one customer says that it helped the stomach issues that their Boxer experiences with other dog foods. Another customer states that his dogs love the taste of this food so much he can barely get the dish to the floor without being bowled over by his Boxers. There are no grains or fruits to initiate allergic reactions from sensitive Boxers. This choice of food can be introduced to dogs of all ages and stages of life. This variety of food is often inconsistent of color and quality. Some dogs become ill even after a lengthy time without any problems. When it comes to the best dog food for boxers, it is important to know your dog and what ingredients affect them individually. With a high probability of having or developing allergies, Boxers will benefit the most from Taste of the Wild High Prairie Dry Dog Food. If your “loved one” shows signs of developing allergies, it may be necessary to test out different varieties of high protein foods until your Boxer is happy and itch free.